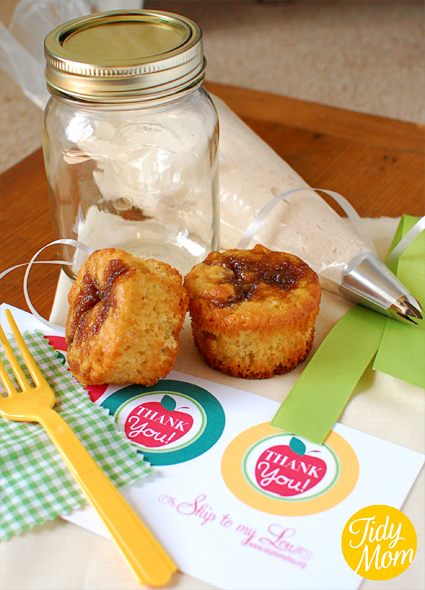 This week is Teacher Appreciation week and Mother’s Day on Sunday I recently shared a fun homemade gift idea over at Skip to My Lou that could work for either event. Nothing says “appreciation” or “I love you” like a cupcake! !…….no wait, maybe that’s my hips! 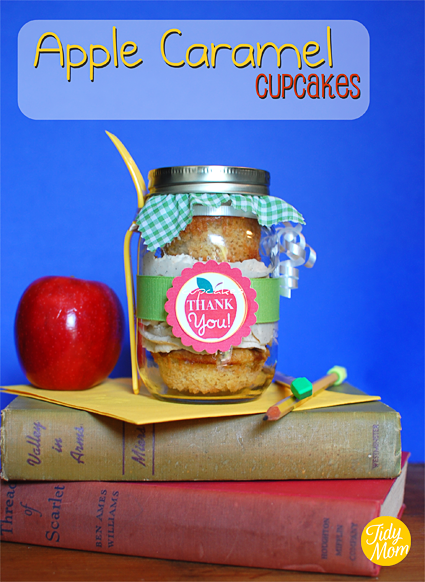 Lol, I’m pretty sure teachers and moms appreciate cupcakes too- it’s in the handbook, right next to apples and kisses. 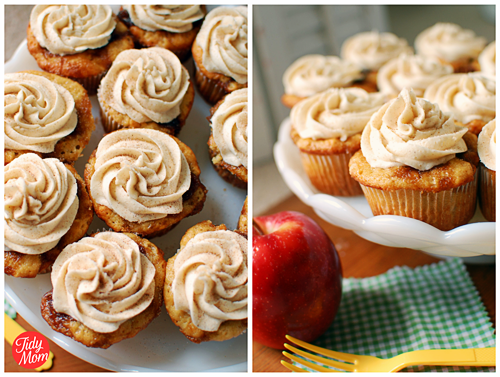 So I thought, why not apple cupcakes!! In a large bowl, beat butter, milk, and vanilla on medium-low until smooth and combined (about 1-2 min), scraping sides of bowl as necessary. Add corn syrup and beat on med-high for about 30 seconds, then increase speed to medium-high and beat for about 1 minute. Cupcakes in a jar would actually, make a great gift for, Mother’s Day, Secretaries Day Graduations, Birthdays….just about anyone or any occasion. I actually gave one to my daughter’s friend “just because” and she was in HEAVEN! The joy of having a fork handy, ready to dig into a jar full of 3 layers of cupcakes and frosting!…What’s NOT to love?! 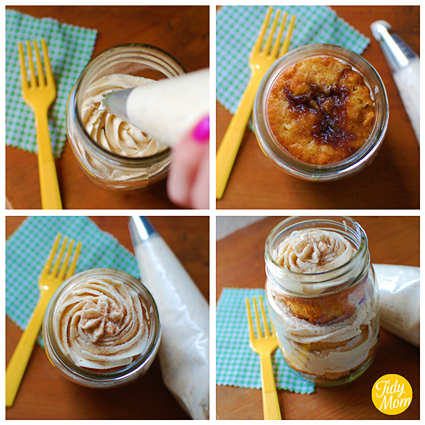 Apple Caramel cupcakes in a jar are super easy and are sure to be all the envy in the teacher’s lounge. Now you’re ready to make it all look pretty! So let’s hear it……do you have some great handmade gift ideas? Tell me about them in the comments or on the TidyMom Facebook page! So, so cute, Cheryl! And your pictures are beautiful!!! Thank you so much for sharing…I LOVE, LOVE, LOVE this idea!! This is going to be of my new favorite “Happy” to give!!! Gorgeous!! And sounds so so yummy. What a great and original idea! thanks! Fabulous Cheryl. 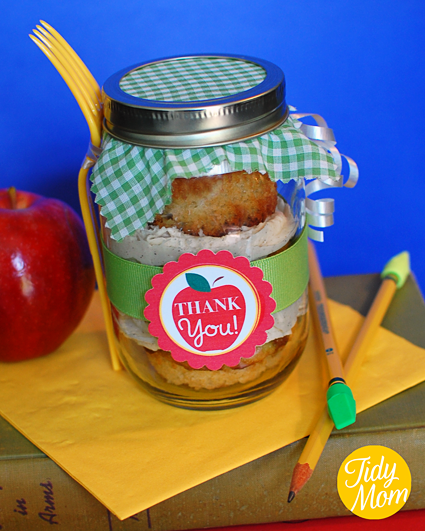 These *in a jar* treats are the best idea to come along since superhero lunch boxes! I’m so in love with these cupcakes in a jar, Cheryl. Such a brilliant idea! Apple-licious Cheryl…wish I’d taught your kiddies! I love this idea, Cheryl! very, very cute Cheryl!! you are the bees-knees! Being a retired first grade teacher, I can assure you this gift would be greatly appreciated by any teacher! Thanks for the idea, and it will be fun making it for my friends who are still teaching! Oh my gosh! That looks and sounds delicious! What a fabulous idea! Yummy! 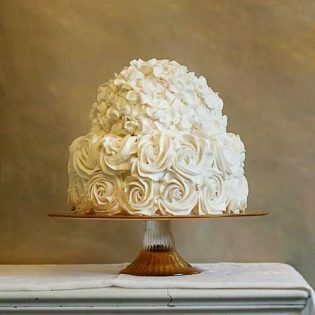 Please share this with our readers by linking it up at Muffin and Cupcake Monday. Thanks! These are a fantastic gift idea! You wrapped them up so beautifully! I’d love for you to share them at the Pretty Packages Party I’m hosting this week as well as the Tuesday To Do party. Put the words apple and carmel together and I’m sold on it! These look yummy and are such a cute gift idea. What a cute idea!!! I love gifts in a jar. The cupcakes look divine Cheryl. I too have a few gift jar ideas for teacher appreciation day. i’m making these today for my sons teachers. i hope they turn out as pretty as yours! Such a great idea! I cant wait to try these! I love the “in a jar” idea! These look so cute… and yummy too! I ADORE this idea!! Thank you for providing this idea! These are so cute!! One question…. do these need to be refrigerated?? I made these the night before I needed them and refrigerated them. I pulled them out in the morning and used them a few hours later. 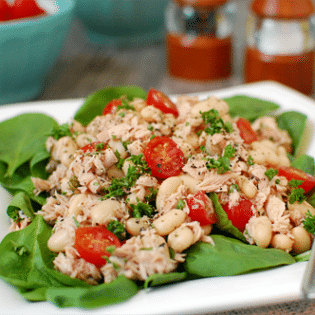 This recipe is making me hungry! You should turn it into a pie recipe and enter it in our contest! You could use evap milk.. These look amazing! And I included them in a Cupcake Round Up on my blog!